L et me start off with a controversial hook: My toddler doesn't have tantrums. Don't get me wrong, she gets whiny when she's sleepy, she bounces off the walls after having some sugar, she defies and disobeys us occasionally like normal toddlers do, but she never gets meltdowns. And if gluten affects toddlers' brains (and it does! ), think of what it does to adult, aging, less-resilient brains. While some may shrug gluten intolerance off as a luxurious preference for more expensive food, an adverse response to gluten is more universal than we like to think. Gluten-free is not a food fad. Mary Lochner, author of viral Anchorage Press article "The Gluten Made Her Do It: How Going Gluten-Free Saved My Daughter's Mental health" was initially skeptical of what she wrote off as a food-fad. Lochner writes, "When someone told me they were gluten intolerant, I silently thought "Maybe. Or maybe it's all in your head, and when gluten-free isn't cool anymore, you'll suddenly be cured." Many people think that we've eaten gluten for ages now, and it's an integral part of the human diet. Renowned neurologist and international bestselling author Dr. David Perlmutter calls gluten a "foreign protein to human physiology" and that humans ate gluten-free for 99% of our existence. We have been on a gluten-free diet for over two million years, and when you introduce a foreign protein into our systems, it triggers inflammation which exacerbates, if not causes, almost every disease we know. Humans weren't designed to consume wheat, and it was only what they subsisted on in times of famine. ​While it works well to prevent starvation when nothing else is available, having wheat as a diet staple is an entirely different story with disturbing repercussions. Frankenwheat: Your addiction to bread is physiological. When people find out that our household is gluten-free, the most common response is "I could never give up bread." I know you may think that you just love bread so much that you say you're addicted to bread in jest, but there is actual addiction involved. Cardiologist and New York Times #1 Best Selling author Dr. William Davis categorically stated "Wheat is an opiate." There are actual physical reactions to this addiction. It sounds funny but it preoccupies your brain, you get nervous, foggy or tremulous a few hours without bread after eating it, and you desperately start seeking out another "hit". Truth is bread begets bread. ​Dr. Davis says "But the “high” of wheat is not like the high of heroin, morphine, or Oxycontin. This opiate, while it binds to the opiate receptors of the brain, doesn’t make us high. It makes us hungry." To explain how wheat works, Dr. Davis says, "This is the effect exerted by gliadin, the protein in wheat that was inadvertently altered by geneticists decades ago during efforts to increase yield. Just a few shifts in amino acids and gliadin in modern high-yield, semi-dwarf wheat became a potent appetite stimulant." Today's wheat is so genetically altered since the 1960s that it is even more foreign than it already was to begin with. Quantitatively, wheat stimulates calorie consumption, making you consume 440 more calories per day on average. It's no wonder people who try to eat healthier by incorporating more "healthy whole grains" into their diets and exercise almost to the point of excess continue to lose the battle because of this appetite-stimulating opiate. Seen from the lens of wheat being a drug, it's easier to see why people have difficulty controlling their eating impulses. 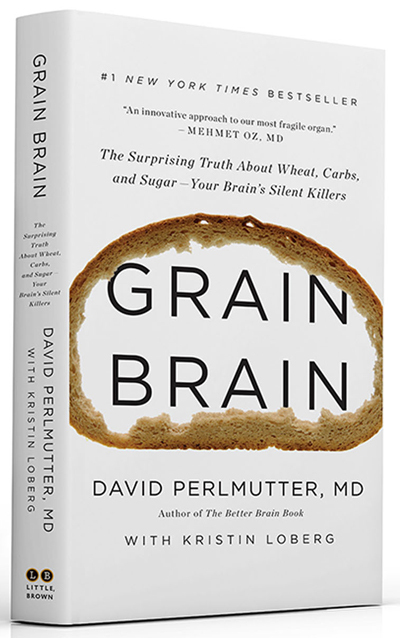 It's no wonder "Grain Brain" by Dr. Perlmutter is an international bestseller. His findings show a clear link between gluten and neurological issues. “Inflammation is the cornerstone of Alzheimer’s disease and Parkinson’s, multiple sclerosis — all of the neurodegenerative diseases are really predicated on inflammation. Who knew?, he says." Newer studies even suggest that the protein composite of gluten can be related to large changes in brain tissue, specifically, white matter, which is actively involved in neurogenesis or the growth of new neurons, in those sensitive to gluten. Eating gluten does what chemotherapy does, disrupting neurogensis, with effects that are far-reaching. For the longest time, we have thought of gluten-intolerance to something related to the stomach-- bloating, indigestion. The work of Dr. Alessio Fasano at Harvard indicates that all humans have some negative reaction to gluten. Gluten induces this cornerstone of brain degeneration: inflammation. Also, several studies published by Mayo Clinic concluded that gluten can in fact be related to the risk for dementia. With a plethora of scientific studies, it is clear that those with autoimmune diseases like thyroid issues, Hashimoto, Graves, Multiple Sclerosis and Lupus as well as those with autism, Sensory Processing Disorder, ADHD and even those who suffer from bipolar disorder, depression and schizophrenia experience marked improvements in their symptoms after going on a gluten-free diet. Back to temper tantrums and the link to gluten . 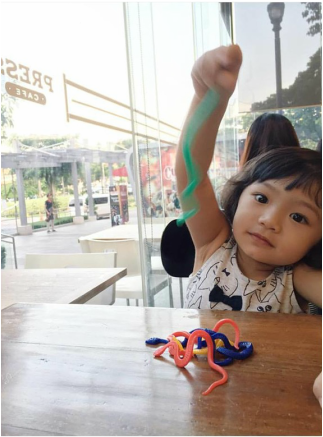 Thankfully for us, our getting into the Bulletproof Coffee and Diet coincided with our daughter, Malaya entering toddlerhood --- the dreaded stage of meltdown madness we'd heard so much about. We all went gluten-free, and from our research discovered that gluten causes the kids' brains to inflame or swell, which causes erratic behavior and mood problems. ​We had been gluten-free for more than 6 months then, but we would notice that after Sunday School, Malaya would behave badly. Still not going all-out nuts, but certainly much less manageable than she normally was. Zach figured out that it was because their snacks were usually crackers or bread sticks-- gluten. We started to bring her own snacks every Sunday, and instructing the teachers not to give her any of theirs, and she was back to normal. --it sounds unreal, but the results are undeniable. 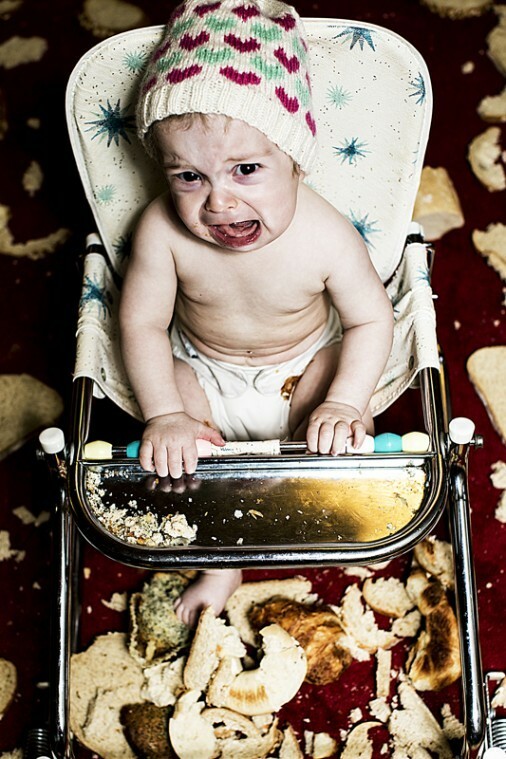 Eliminating gluten even helps in more complicated temper issues in kids. In the article I cited earlier from Anchorage Press, "Gluten Made Her Do It", Mary Lochner recounted her issues with her daughter who had really bad temper tantrums. The doctors she consulted were condescending towards her, telling her it was a 'normal toddler pattern'; but she was not convinced. Her daughter was later diagnosed with Sensory Processing Disorder which includes intense behavioral reaction to sensory input that most people don't even notice like being touched or being set off by certain sounds. ​ She then stumbled upon the article by Kelly Dorfman, author of "What's Eating Your Child" that said gluten intolerance sometimes manifests with 'neurological symptoms'-- in short, it's not just in your gut: it messes with your head. Lochner then read the book, and working closely with her child's pediatrician, went on a three-month gluten-free trial. This involved going a whole month without gluten, then going back on gluten for another month, and then back off gluten for the last month, dutifully chronicling changes in the behavior to be able to isolate it to gluten. She recounts that the first month went surprisingly well, and that it was almost hard to believe the child was the same person. Then came the dreaded second month, where they had to go back to gluten and it was hellish. The bad old days were back and they could hardly wait to get back to the third month . Even just within the first two weeks of going back to gluten-free, her daughter's temper tantrums had lessened and by the end of the month, they were down to only two to three occurrences per week-- and remember that hers is an extremely difficult case at that. Lochner says, "It’s not a miracle cure,” I thought, “But it’s a lot better.”But I was wrong. Going gluten free was my daughter’s miracle cure. After six weeks on the gluten-free diet, her awful screaming and flailing episodes, the ones that would last for hours and come out of nowhere, were gone. Vanished. A thing of the past. It was like she was a completely new, and different, person. Now, if my daughter got upset, there was an obvious reason, and she could be reasoned with. Her distress never lasted more than a few minutes. My daughter started looking me in the eyes again. She easily relaxed into a snuggle. But the best thing about it was finding out that underneath her old symptoms was this ebullient, curious, affectionate little girl who is so thoroughly level-headed you would be hard pressed to connect her to her former self. 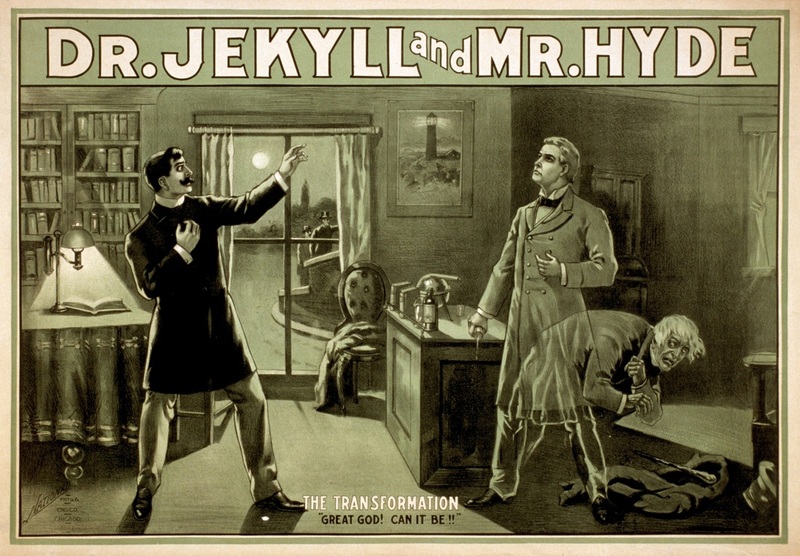 Mary Jean’s transformation was like the fabled one between Dr. Jekyll and Mr. Hyde. ​​​"
So what now? Is it as difficult as it seems? The short answer is "NO." Without Bulletproof Coffee, it would be a harrowing ordeal, as it usually is with any addiction. It isn't impossible to go gluten-free without Bulletproof Coffee, but I can tell you it's much easier with it. Bulletproof Coffee was integral to our being able to going gluten-free because it fixes your gut bacteria to program you to have 'better cravings'. A lot of people who didn't know us pre-Bulletproof think we've always been health buffs, but that isn't the case. We were totally unhealthy, eating processed food day in and day out, indulging in all the fast food we could get, particularly since we're in video production where days are long and healthy food is hard to come by. Bulletproof is a hack to help you get over your addiction to unhealthy food-- gluten, fast-food, sugar. Within the prescribed two weeks of adhering to the diet to the letter (no gluten, no carbs or sugar at lunch, the strangest thing happened: I started craving salads and dark chocolate-- stuff I would never crave! And my sugar and bread cravings were almost totally gone. Asprey recommends getting on this 2 week diet to be able to feel what it's like to be "Bulletproof". Once you know what it's like, it's so much easier to say no to what used to be impossible to resist. We get all our gluten-free baking ingredients from Healthy Options.